A giant continued thanks to Dringend for sponsoring this week's bites! Dringend lets us build and run our apps directly on our iOS devices. We can see warnings/errors during builds, then run the app right on the same device we're editing its code on! Dringend works with standard Objective-C and Swift Xcode projects. We can browse them, open files, and edit them. Just like in Xcode on the Mac. Let's step back a second to appreciate how cool this is. We've opened our Xcode project, built it, and run it, all on our iOS device! Full git support is also included. 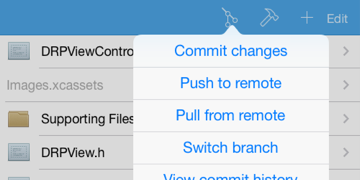 Dringend let us push, pull, commit, switch branches and even has submodule support. Additionally, Dringend has full support for syncing projects we stored on Dropbox! Last but certainly not least, Dringend has a full-featured code editor with syntax highlighting for Swift + Objective-C, full find/replace support, and even project-wide file search with regex support! Dringend is being actively developed, with features like Storyboard support coming down the pipeline now. Working on Xcode projects on iOS like this simply feels like magic 🎩. Dringend is an amazing piece of software. Get it. Dringend is available to download now at dringend.cc.